Demonstration & Trial - Sunburst Software Solutions, Inc. 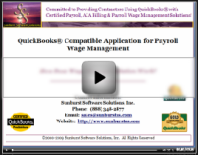 Wage Manager Solution works with QuickBooks Pro/Premier 2003-2015 and Enterprise 3.0-15.0. This includes any off the Premier or Enterprise Edition version (Accountant, Contractor, Manufacturing,....). Wage Manager does not work with 2002 or prior, Simple Start, Basic, Mac, or On-Line Editions. See the Wage Manager Solution Computer & Software Requirements page for additional details. You may download a Free Trial at the bottom of this page, but first, a quick overview. Wage Manager Solution allows you to import and view your employees, the payroll wage items, and pay rates that are currently assigned to them in a convenient spreadsheet type layout. After this information is in Wage Manager, you can create new payroll wage items and pay rates; modify existing payroll wage items with new rates; or remove obsolete payroll wage items-assigning the changes to one or multiple employees within the grid. Writing the information back to QuickBooks, at the click of a button. Selecting an existing payroll item and then clicking the Copy button, will allow you to copy an existing payroll structure; creating items for straight time, over time, double time, and triple time, all at the same time, and assign the new payroll item to multiple employees at once. Download the default Wage Manager Solution Trial (10.42 MB) (10.92 MB) installation. Save the file on your hard drive for future reference or choose "Open or Run" instead. Download the pdf Wage Manager Solution Read Me (85 KB) file, containing a written tutorial on how to use the program. During the trial period, you will be unable to write or save any new payroll items or changes back to your QuickBooks file. Existing CPS customers should NOT download the trial, as you already have a licensed version of Wage Manager available from the CPS, Run menu and choosing Wage Manager.